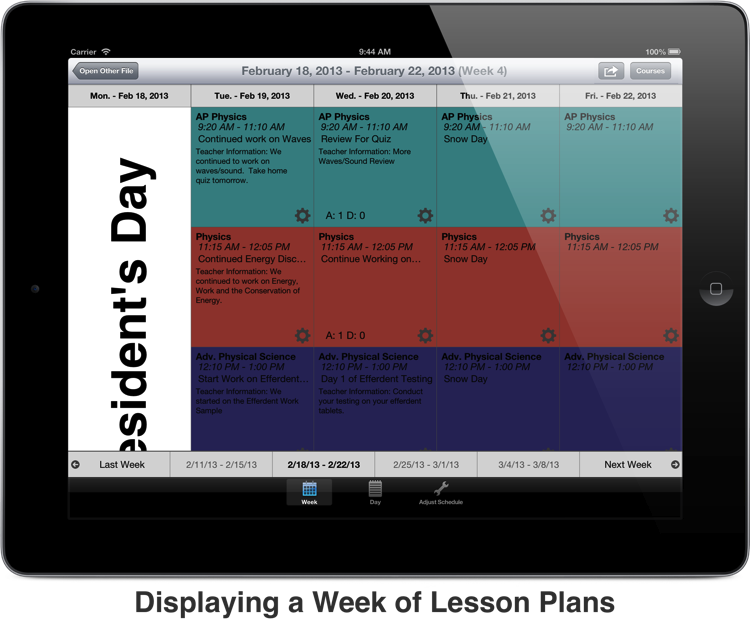 Planbook Touch for iPad: Powerful and Elegant Lesson Planning Software for Educators. Planbook can accommodate schedules where you teach the same thing each day, your classes change each day but repeat weekly and rotating schedules (up to a 14 day rotation). 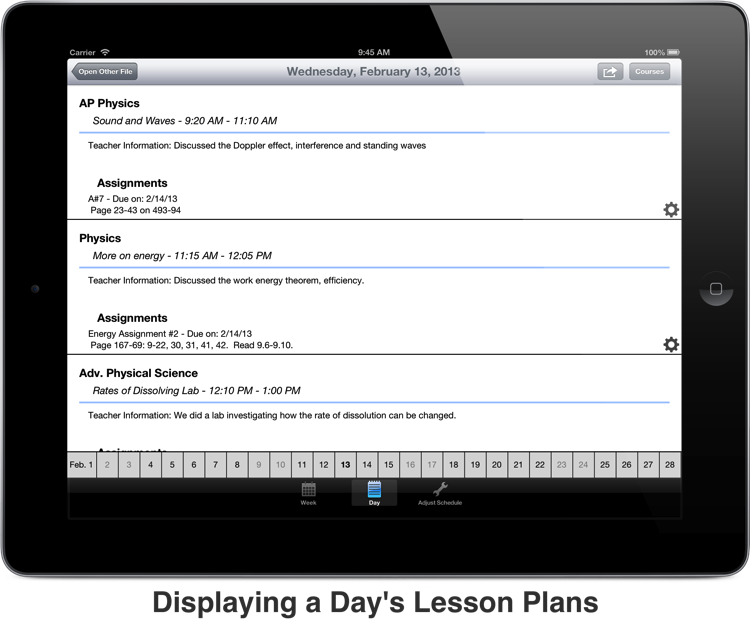 Planbook gives you 6 customizable fields to hold your lesson plans. You change the default field names to reflect how you teach. Planbook Touch lets you attach any web link or file directly to your plans. To link files to your plans, you'll need a Dropbox account. 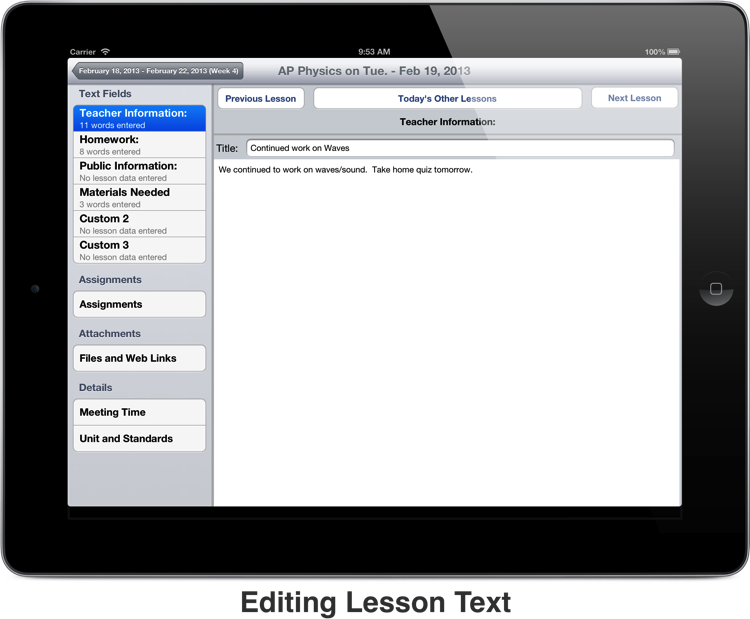 Now you can pull up a PDF, document, image or movie right from your lesson plans. Planbook makes it easy to share your plans with your administrator, other teachers or students via print or email. 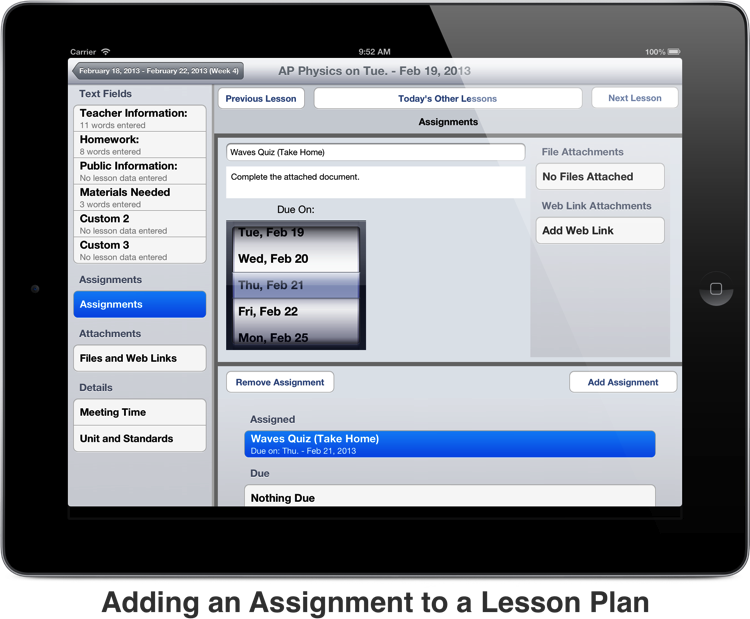 You can print or email a day of lesson plans or an entire week, depending on the view you're in. When the weather gets rough (or any of the 100s of things happen that can affect your best laid plans), Planbook lets you quickly bump or pull back lessons to adjust your plans. Planbook also lets you make non school days to reflect holidays, in-services, weather days - whatever comes your way. Planbook Touch lets you view standards you've previously entered using Planbook for Mac. A future update will allow entering and applying standards directly on the iPad. 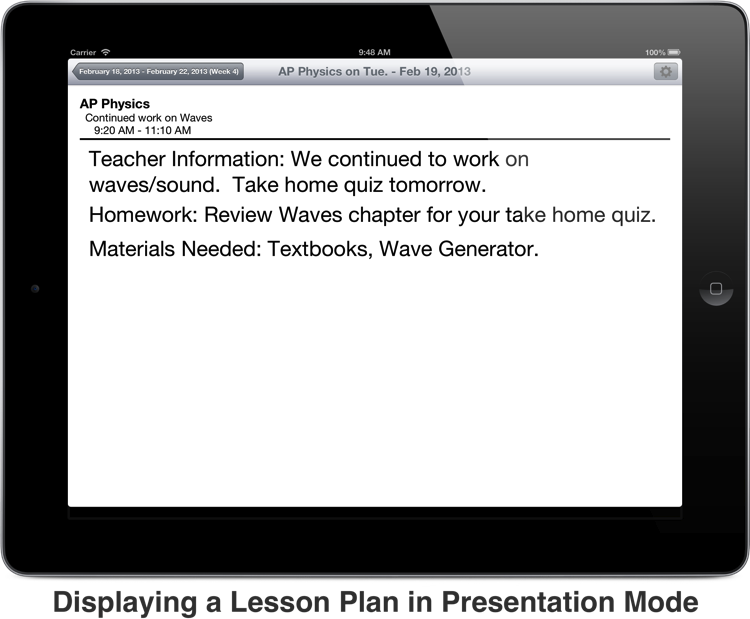 Planbook Touch lets you upload your lesson plans (for use with Planbook for Mac or Windows) to your Dropbox folder. 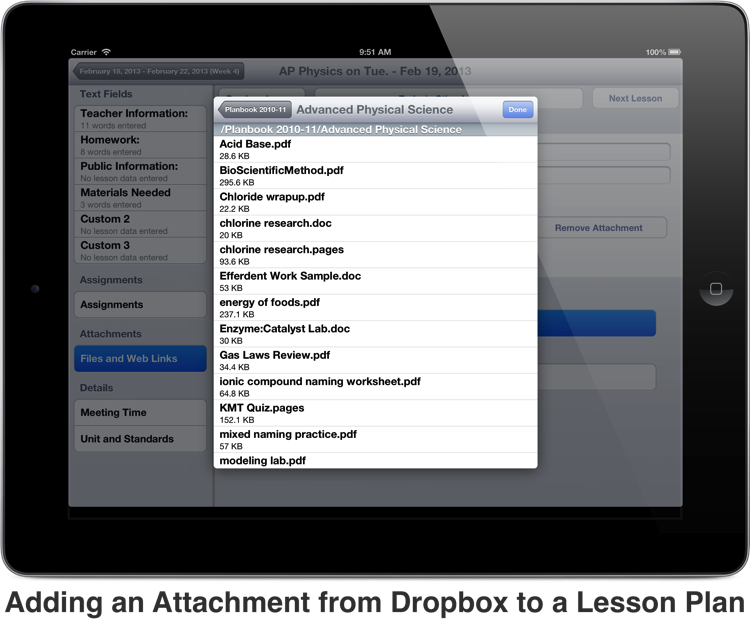 You can also download and link files stored in your Dropbox folder directly to your lesson plans. Support for Google Drive is coming, too. Even those in schools with the strictest schedules will sometimes need to adjust their schedule to accommodate changes. Planbook lets you convert one type of day to another (an A day to a B day) or even create (and reuse) custom schedules (such as an assembly schedule or half-day schedule). Documents that you create with Planbook Touch can easily be opened using the companion Mac and Windows applications (requires Dropbox for wireless document transfer). 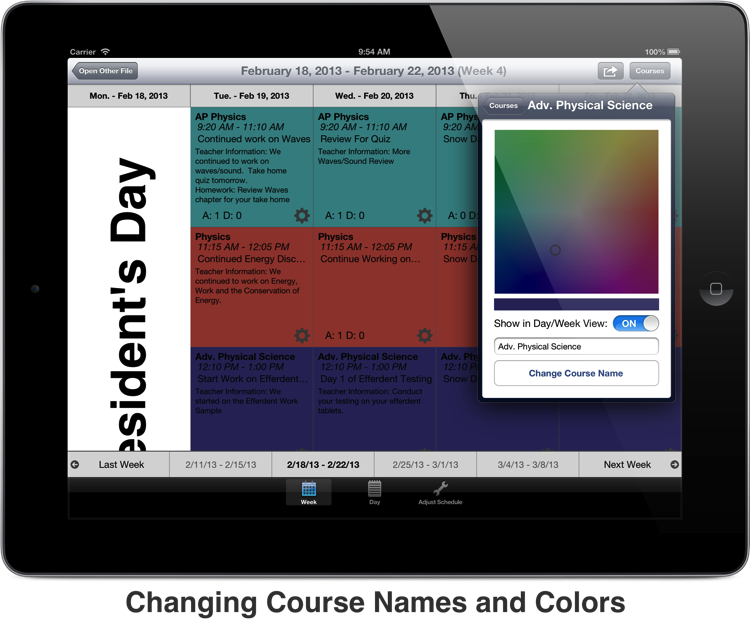 You can easily make changes and view your plans using the iPad app while teaching in your classroom and, if you'd like, make more substantial edits and changes using either the Mac or Windows versions (sold separately) of the software when you get home. Hellmansoft offers several ways to get help with Planbook, usually responding within a day of receiving a message (and often much, much faster). Updates to Planbook are regularly released and are free for licensed users. Watch Video Overviews of Planbook Touch. These videos are all narrated, so please turn up your volume. Download a higher resolution video here. When you purchase Planbook Touch for iPad, you can install and use the software on all of your iPads. When an iPhone version of Planbook is created, it will be a free update that runs on all iPhones and iPod Touches.